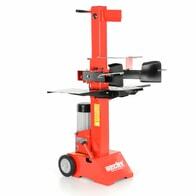 Electric log splitter with a maximum pressure of 7 tons. Power consumption 3000 W. Max. wood diameter 300 mm, maximum wood length 1050 mm. Weight 98 kg. 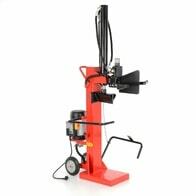 Vertical electric log splitter. Power consumption 3500 W. Max. pressure 12 tons. Max. log length 1300 mm. Weight 180 kg. Max. wood diameter 400 mm. 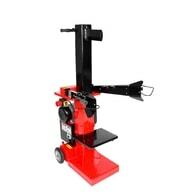 Super heavy duty 22 ton petrol log splitter. Can be used in both horizontal and vertical positions. 4-stroke Briggs & Stratton XR950, 208 cm3, 6,6 HP. Max. pressure 22 ton. Max. log length 63,5 cm. 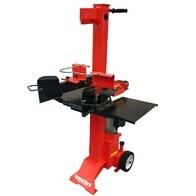 Log splitter is supplied with integrated tow bar. Weight 225 kg.